#Dostoevsky. #StPetersburgDostoevsky. #FyodorDostoevsky. #RussianLiterature. #CrimeAndPunishment. #Raskolnikov. #RussianWriters. Dostoevsky’s Petersburg. Private walking tour around St.Petersburg Russia. What to see in St Petersburg Russia. Things to see in St Petersburg Russia. things to do in St. Petersburg. Fyodor Dostoevsky is obviously one of the most famous Russian writers. He was a genius who explored and understood human nature deeper than anyone else. Now, more than a hundred years after his death, people all over the world are greatly interested in his novels, his biography and his personality. Though Dostoevsky was born in Moscow where he spent the first 16 years of his life, it was St. Petersburg that became the city of his life. His most important novels were written here, the majority of his characters lived in our city and above all the city itself became a real character of his novels. Dostoevsky never lived in or described in his works any of aristocratic areas of St. Petersburg such as Nevsky Prospect or Palace Square; his city is the city of poor clerks, the city of poor and homeless people. These areas are never included into ordinary sightseeing tours but tourists show a special interest now though they have greatly changed since the time of Dostoevsky. During the tour we will not only visit some sights connected with Dostoevsky’s life and work but we will also try to show you “Dostoevsky’s Petersburg”. We hope that behind the well painted facades your imagination will help you to see those shabby houses where Raskolnikov, Sonya Marmeladova, Netochka Nezvanova and others lived. A 30-40 min walking tour of the so-called Dostoevsky area, “inhabited” by the characters of his novel “Crime and Punishment”. You will see that very buildings where Raskolnikov lived, walk along the same streets and embankment where he walked and at least partly follow the murderer’s route from Raskolnikov’s house to the house of the Pawn Broker whom he killed. A short metro ride (one stop). You will see the metro station named after Dostoevsky and known thanks to its special design which reflects the atmosphere of Dostoevsky’s novels. You will also see a monument to Dostoevsky. Tour of Dostoevsky’s apartment museum. It’s his last apartments where he lived with his second wife and two children since October 1878 up to his death in January 1881. His last novel The Brothers Karamazovs was written there. The tour will give you an idea about everyday life of the great Russian writer. Visit to the Vladimirskaya Church where the burial service for Dostoevsky was held. It’s an ordinary active church not frequented by foreign tourists except Dostoevsky fans. One more metro ride (2 stops). A visit to Tikhvinskoe cemetery at the Alexander Nevsky Monastery. It’s a very special grave yard where a lot of the most famous Russian writers, musicians, painters and actors were buried. 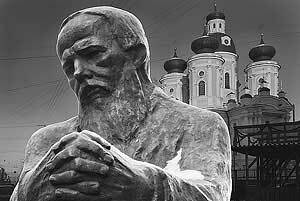 You will see Dostoevsky’s grave and will have a chance to honour the memory of the Russian genius. The tour lasts for about 4 hours. The tour is available all week long except Monday and official holidays. On Thursday the tour will be conducted without a visit to Alexander Nevsky grave yard.